It can be difficult to find comfortable dress boots for large calves. Some styles are difficult to get on while others grow increasingly uncomfortable through the day. A few style and fit tips may be all you need to find the perfect pair of boots to take you to the office and back on any day there is inclement weather, but you may also want to update your wardrobe by shopping for a few new styles. There is no standardized measurement for a "wide calf boot." The boot shaft on a B-width boot usually has a calf measurement of about 14 inches. "Wide calf boots" can be found with calf measurements anywhere from 15 inches to 23 inches, with most 17 inches to 20 inches. Most wide calf boots are combined with a wide width shoe. This works for many plus size women. However, many plus size women don't wear a wide width shoe. Until recently these women had to suffer along with a too-wide shoe in order to have a boot that fit their larger calf. In recent years, several boot manufacturers have introduced the wide calf option on a narrow or medium width boot. 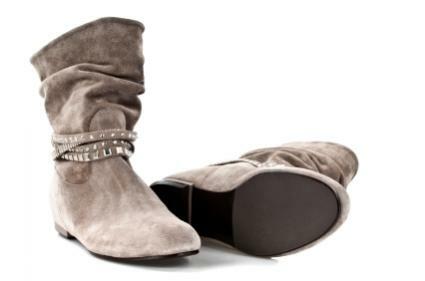 Most boots have a 14- to 15-inch tall shaft. The width of the boot may be the same at the top as it is at the bottom, like a stovepipe. In some boot styles the boot might flare out from the ankle with the widest portion of the boot being around the top. Lace-up: Back-laced or front-laced boots can be widened or narrowed by adjusting the laces. This is a great style for a wide calf leg that needs a boot to be pulled in around a narrow ankle. Crunch: Some boots are soft enough to push down toward the ankle. This "crunching" of the boot provides a more casual look. It also moves the boot down the leg and makes it more comfortable for a larger calf. Inside zipper: A long zipper on a boot lets the boot shaft be opened wide enough to insert the foot, pull the boot shaft around the leg and zip the boot up easily. Stretch: Stretchy fabrics provide additional room in a boot. Some boot styles are now made with a combination of leather and stretch, which can provide a little ease where necessary. Boots which are constructed completely of stretch fabric are excellent for the woman whose calf is a little fuller than average, but not full enough to require an extra wide calf boot. Sweater knit: Boots are now available with a leather or leather-like foot with a boot shaft made of a knit fabric. 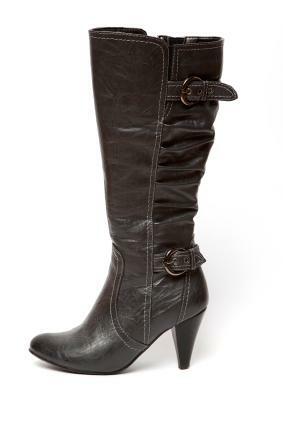 This style of boot is excellent for the extra wide calf such as a 20 inches or larger. The downside to this style is that the knit may stretch to fit the calf and not have enough elasticity to stay up on the calf. Don't assume that the larger the size, the larger the calf. There may be a slight increase in calf width as the shoe size increases. But the big increase in the shoe size may make the boot too uncomfortable to wear, even if it provides a slight increase in the width of the calf. Always measure the calf or ask the width of the calf before purchasing. The terms used to describe the width of the calf may be misleading. A wide calf boot by one manufacturer can be the same width as an extra wide calf by another manufacturer. Remember to try the boot on with the same leg wear that will be worn with the boot. A boot can feel great with pantyhose but be too tight when worn with socks. Boots, like belts, are a key fashion accessory regardless of dress size. They can add the finishing touch to a plain skirt and sweater outfit. A pair of fashion boots can turn a classically styled dress into a fashion-forward outfit. Whether you prefer lace up boots, boots made from a stretchy fabric or a pair that zips closed, dress boots put the finishing touch on many outfits. Wearing dress boots that fit your feet and calves comfortably makes you look fashionable and feel confident and stylish.